Rain gutters in Houston, TX are responsible for protecting both the uppermost and lowermost components of your home or building. Every time it rains, the roofing system will be the first landing spot for the moisture. A clogged or malfunctioning rain gutter will keep the water stuck until it flows onto the roof. Alternatively, a bad gutter system might just drop all the water right at the base of the building, which is a problem for its foundation. The leaks, damage, and settling involved gutter problems can shut your business’s doors, or at least keep you from operating at 100%. Read on and protect your investment with commercial gutter installation from Berger Home Services. A commercial building needs commercial rain gutters to protect the hotel, office space, or restaurant that you run. If you’re not prepared for a quality commercial gutter installation, you shouldn’t be surprised if you come across mold growth, leaks, or even signs that your foundation is settling. These problems can require expensive repairs, so contact the team at Berger Home Services for professional gutter installation. 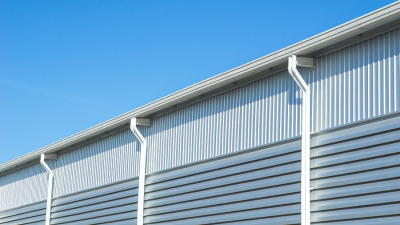 You can get the most out of your investment by having our trained experts install your commercial gutter system.